Just bought our first Golf cart! Would highly recommend!! Brian was very helpful and went above and beyond to find the perfect one for us! Recently purchased my first golf cart from Stevenson Auto Sales in Kankakee. Could not have asked for better customer service from Brian. He answered all my questions and thoroughly went over all the details of the cart. I highly recommend to anyone looking to buy a golf cart to stop by and check out their stock. Brian is a stand up guy! Great to deal with! Had a small little issue, he addressed it immediately and made things right. Would highly recommend purchasing from Stevenson Auto Sales! Great selection of custom golf carts. The buying process was very simple. Will recommend them to everyone. Best experience ever buying a bike! Friendly and helpful service!! Drove 4 hours to these guys and only spent 30minutes or so purchasing the vehicle instead of hours upon hours like most dealers! Very impressed with my experience here! Had a great experience at Stevenson's this past weekend. Staff was extremely helpful and friendly and answered all our questions. Will definitely come back again and recommend Stevenson's to our family and friends. Myself and a friend bought golf carts from them. We dealt with Brian over the phone and was very informative and explained how everything would go. I bought over the phone on Tuesday and drove 2 1/2 hours one way to pick up both carts. We then dealt with Chris when we we're there great guy also. Definitely will be buying more in the future and we are spreading the word so hopefully they will gain more sales from us. Great people great place you can't go wrong. Got a bike from them about 4 years ago and love the bike. I cant remember who I dealt with but very friendly and courteous. Would recommend anyone to go to them for anything with 2 or 4 wheels. Had a great buying experience when buying my 2008 Sierra back in October. No pressure, straight forward and very helpful. Got myself a great truck with no problems. Would highly recommend checking them out. Excellent and honest people! So thankful for these awesome guys. Great people to deal with and especially enjoyed the tour thru the hot rod museum!! Would definitely recommend them to my friends and family! The best place to buy a vehicle from super nice people with great family values. We recently purchased a beautiful golf cart from them. We are from Florida and were hesitant about buying from a small town dealer, however Brian spent alot of time with us explaining everything and made us feel very comfortable about the purchase. Would definitely purchase from them again!! I was looking into buying a motorcycle and Chris was very informative and helpful. Made the process as simple as possible and I will be back for future purchases. Definitely would recommend! I just purchased my first car from a dealership, and Brian made it a breeze! I will definitely go back for future purchases! Wonderful people to do business with. We were so impressed we bought 2 vehicles, not just one. Highly recommend and will spread the word! Just purchased a customized 2012 E-Z-Go cart from Stevenson's, Brian and Chris made the deal absolutely painless and easy. The hardest part was deciding which custom paint scheme I like the best. I recommend Stevenson's if looking for a used car, bike, or custom cart. Recently purchased a 2010 Honda CBR600RR for not only a great price but in great condition. ll of their vehicles, bikes and cars are taken great care of and sell only quality material.Came in for a few questions a week later and was provided great customer service right away! From great prices and fantastic customer service, Stevenson Auto Sales is the perfect place to purchase your next vehicle. 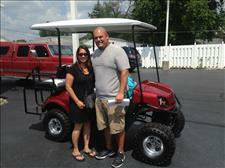 Excellent overall experience while purchasing a custom golf cart! Only difficulty was figuring out which of color schemes was my favorite. Would highly recommend to anyone! Brian Stevenson helped me find and finance my 2008 Harley-Davidson FXDF. They priced the bike fairly to begin and even worked with me on the price. He stayed late for me on multiple occasions and was very attentive to my needs & concerns. Overall the business is exactly how you imagine a small, family run shop. Friendly people willing to go the extra mile to earn your business. I highly recommend purchasing a vehicle from Stevenson Auto. They also have excellent resources for financing and credit options. Brian put me in touch with multiple financiers and helped me shop for the best possible rate. Top notch customer service on all counts. And the bike is sweet too. I purchased my awesome 2010 Ez-Go golf cart from Stevenson over the weekend. Brian and Chris were professional and fun to chat with. No haggling, just straight to the point! Brian delivered the cart same day on top of adding all the accessories I wanted. When it was delivered to my camping resort Brian went over everything in detail one more time. During the final deliver checklist review one of the headlights wouldn't turn on. Brian took prompt action to discover it was a faulty contact in the harness and connecting contacts. Brian drove all the way back to his shop in Kankakee and came out with a new harness and connector to fix the issue within a couple of hours! Now that is commitment to 100% customer satisfaction! Stop by and see the great sales and racing team at Stevenson Auto Sales and Repair!! 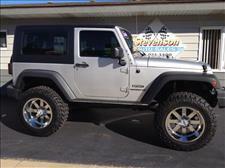 So, we bought a Jeep Wrangler from +Stevenson Auto Sales this past Friday. Yes, they are located just a little south of Chicago, but the Jeep has everything we were looking for - and we've been looking for a long time. My biggest fear about buying from them was what if after making the 4 hour drive the Jeep was misrepresented or there was something wrong with it that they didn't tell us. My fears were put to rest after meeting with the the owner of Stevenson Auto Sales. He was very honest with us by pointing out small defects that we had overlooked - he wanted to make sure we knew as much as we could about what we were buying. We've put over 1000 miles on the Jeep and are absolutely, completely satisfied - not only with the Jeep, but with Stevenson Auto Sales. Highly recommended! 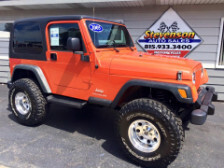 Shop Stevenson Auto Sales for all your used vehicle needs. Stevenson's is family owned and operated. The staff is very knowledgeable, professional and courteous. If your looking for a specific vehicle Stevenson's will help you find it. Stevenson Auto Sales also offers financing to help you get into that new used vehicle. All of their used vehicles have been inspected by Stevenson Auto Repair just down the block so, you are assured a good running vehicle. Stevenson's sells cars, trucks, motorcycles, and golf carts they offer a decent selection to choose from. I give a 5 star rating and a thumbs up for a great business and a great place to buy that new used vehicle. I recently bought a Golf Cart from Stevenson's. This was the most painless purchases I've ever had. These Carts are perfect for riding through town (which is why I bought one), or a camp ground. I'm writing this review mainly because of the service I received after I had the Cart home. I ran into some minor trouble and gave these guys a call. They sent a trailer and picked up my cart and within 8 hours they had my cart back to me, at by home. I live 20 minutes away from the Dealership...the service is top notch! Without a doubt, I would recommend anyone who wants a Golf Cart or even a new vehicle to stop by and take a look at what Stevenson's has to offer. Great experience with them! Very professional and awesome work on my Jeep. Would recommend to anyone! Hey everyone.. I`ll give a *F*I*V*E* to "Stevenson Auto Sales" especially to Brian. 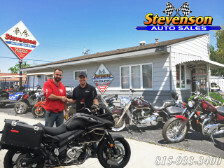 Firstly I had a great time at Stevenson Auto Sales about buying my new motorcycle, and they have very professional customer service. Brian help me about my dream, and finally get my Kawasaki ZX-14R. He was very professional about doing his job, and I like people like him who make Quick & Good deal. I recommended "Stevenson Auto Sales" to everyone who`s looking for new Car, Truck or Motorcycle !!! My husband Russell looked on line for a year at golf carts. He decided he wanted to get a golf cart from our area. Russell had talked to Brian a couple of times, he found one on line that he liked and we went up to look at the carts. We could not of asked for better service. Brian pulled out a couple of the carts, so we could look at them, he answered all of our questions, he let us take it for a little ride. He went above and beyond, showing us the different components to the cart. Before we left with our cart, he explained everything that we needed to know about it. We also know if we forget anything he taught us, we can call him and he will help us.  This week, I purchased a car from Brian at Stevenson Auto Sales. This is the 12th vehicle I've purchased in my life and I cannot remember a more pleasant buying experience. From the inventory he had, we selected the appropriate car for my needs, negotiated a fair deal, and concluded the transaction smoothly. I never once felt pressured or pressed while making the deal and Brian answered every question I had with patience. Overall, a great experience and I will definitely return the next time I consider buying a vehicle. Brian and Jolynn are the best in the business! The service I have received has been top notch, and the sales process was easy. I will be a customer of the Stevenson family for many years to come, and would recommend them to anyone. Brian sold me a 2004 Wrangler, and it was such an easy buy. He was very professional gave me a great deal. He even stayed after hours so I could come pick it up. I highly recommend buying from the place. You will not regret it one bit. They also did a great job detailing the vehicle before it was sold. Great place definitely 5 stars. Great service and great deal. Quick customer service and very knowledgeable. Brian was great to work with! Nice selection of golf carts - very happy with our purchase! Top notch dealership. I purchased a golf cart and could not be happier. Brian was nothing but professional as was his father. A true father/son dealer that gives and cares the extra effort. I will without a doubt refer anyone who is looking for a golf cart (or car/bike for that matter) to these people. Cart was EXTREMELY clean and I received many, many comments on it when brought to my resort. You will not be disappointed. I had a very good experience with Stevenson Auto Sales. Recently I bought a nice motorcycle from him. I'll be back soon to buy a car or SUV. Stevenson Auto has great customer service. Drove over 200 miles to check out a Yamaha R6 that Brian had listed on Craigslist. The bike was absolutely immaculate and couldn't find a scratch on it. I always question what people's "perfect condition" is on Craigslist but this was truly perfect. There wasn't any BS dealing with Brian, straight shooter and would definitely deal with him again. Just had a Great experience with Brian @ Stevenson Auto. Found the vehicle on line and made a few calls, drove 100 mile to get there and it was worth it. They know cars and repair them in there own shop that I would love to have myself. The vehicle was as great as advertised and Brian took the time to show me a scratch I never would have seen. That's the way I like to do business. It may sound too good to be true, but I will call Brian first for my next deal. Great people that are easy to deal with. Local and family owned. Brian is always genuine about helping! Great salesmanship and customer service! What a great experience! Super friendly stuff and for the first time I felt like dealer doesn't want to rip you off! 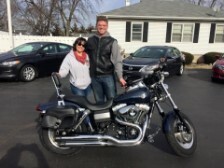 I did buy my share of vehicles and motorcycles but my last deal at this family business was the most friendly and relaxing I ever did. Highly recommended! Recently bought a 2012 zx6r motorcycle from them. Never met a place with such incredible customer service! Brian stayed 2 hours past the closing time to wait for me to just come see the bike. And when i got there he wasn't nothing but kind and understanding about be held back late. On top of that he was more then helpful by giving me a hand to load the bike on to the trailer in the middle of a rain storm. Chris was also nice and made me feel welcomed when we were finishing up the paper work. He double check and triple check that all the information was correct with out mistakes. This is a great company! I am one very satisfied customer, and there customer service quality is what mainly made the sale for me! I will definitely be recommending them to anyone who is in the interest in purchasing a vehicle! I mean come on! This company has a 5 star on google! This is an incredible team that you can tell is full of kindness! Thank you to the team members at Stevenson Auto Sales! !